Harrell aims to develop and market an agri-tourism location on his 200-year-old farm so that it has many activities, crops and value-added processing on a year-round basis. For decades, tobacco was the primary cash crop for the Harrell Hills Farm until Doug stopped growing the crop in 1999. The primary source of income for the farm became Christmas trees and Limousin beef cattle. 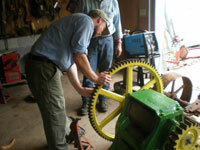 Doug envisions 4-H, FFA and school groups assisting with and learning from the farm. With the WNC AgOptions award, Doug will build a pole barn and picnic shelter that will house a molasses mill and apple butter kettle. 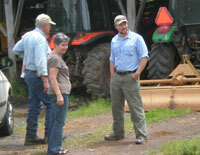 He will promote field days to local school groups to see the production of apple butter and molasses. In addition, Doug plans to plant a pumpkin patch for pick-your-own harvest and a variety of vegetables to market locally.